Unless you’re a financial geek (and many of us are, no judgement there), paying down debt, balancing multiple checkbooks, and keeping a watchful eye on your investments isn’t exactly fun. In fact, it can be downright tedious. While I personally love anything related to finance, I also like to keep my money as simple and streamlined as possible. Streamlining the process helps me manage my time and my finances well. Tired of spending a lot of time on money management? 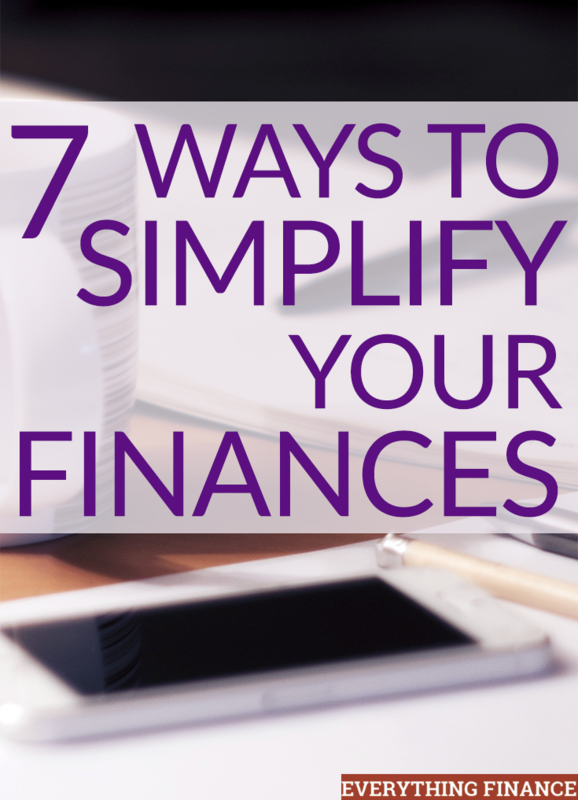 Here are my 7 best tips on how to simplify your finances. I can’t tell you the last time I mailed off a check as a payment for a bill, or worse, driven to the business to pay the bill. That’s way too much time and effort! I love paying all my bills online. When I can, I set up automated payments so I don’t even have to think about it. All I have to do is make sure I have enough money in my account when the bill is due, and it’s taken care of. Every time I receive a paycheck, a chunk is automatically taken out for my retirement account, another percentage of my net income is deposited into my savings account, and the rest goes into my checking account. The money is automatically deposited into savings, so I always know I’m going to be saving a specific amount of money each month. By automating it, I don’t even have to think about it. That extra money never reaches my checking account where I might be tempted to spend it. The checking account is where we keep enough money for our monthly bills and living expenses. The savings account is where we keep our emergency fund, savings for future house repairs, and, once it builds up, extra money for taxable investing. Everything gets accounted for in a few simple accounts. Speaking of having just a few accounts, balancing multiple checkbooks, logging into 6 different banking websites, and keeping money in several different banks doesn’t appeal to me. In fact, the thought makes me downright nervous. It may be a morbid thought, but if my husband and I die in an accident, I don’t want my family to have to scramble to find where all of our assets are or, even worse, to completely miss one. That’s why I think it’s important to not only leave evidence of your assets (in your files or through a living will), but also to streamline it as much as possible by keeping accounts to a minimum. A lot of people are fans of having multiple savings accounts, each with a different purpose such as a new car fund, Christmas fund, vacation fund, etc. I prefer to have the bulk of my savings in one account, while having certain amounts earmarked for each purpose. If you prefer the separate accounts, you can streamline your process by keeping them all at only one or two institutions. I’m the kind of old-fashioned person who sits down and actually uses a pen and checkbook register to balance my checking account every week. It sounds outdated, but the process itself somehow makes me feel like I’m on top of things. Whether you use the same method or simply prefer to compare your receipts with your online banking account, sit down once a week to do this and clear out all of those receipts once you no longer need them. I don’t know about you, but a big pile of receipts staring at me really agitates me, so I like to get it done once a week so the pile doesn’t have time to build up. The simplest way to invest is through index funds. It’s passive investing, it’s easy, and you don’t have to worry about it too much. In fact, there’s nothing wrong with checking it once every few months, and that’s why I like it. Index funds are low-cost and low-risk because they follow the market average. If you’re a lazy investor like me, index funds are the way to go because you can “set it and forget it.” As long as you have the time and desire to invest long-term, you don’t need to worry about what the market is doing on a daily, weekly, or even monthly basis when you invest in index funds. There are very few reasons to still receive paper statements these days, especially since everything can be paid online. Going paperless not only helps the environment, but it also helps keep your information secure. It’s easy to have all of your bills sitting in your email inbox for you to deal with when you’re ready. I prefer to have all my bills emailed to one email account. I pay them as they come in so it’s quickly checked off my to-do list. Another idea is to utilize one of the many (free) online websites such as Mint.com to help you track everything from the value of your home to the day your bills are due to how much debt you have. On one screen, you get an overall view of your financial life, right down to your net worth, and you can opt to receive email notifications when upcoming bills are due. Mint is free and easy to use, and your information is secure. Simplifying your finances can help you in so many different ways. There’s no need to make it complicated. Whether it’s through a simple investment strategy or closing out redundant bank accounts, simplifying your finances can help you keep track of where you are financially and make it easier on you to keep track of your money, which will help you in the long run. In what ways do you simplify your own finances? Do you keep multiple savings accounts?